Frustrated in her current job because there was no place for her to grow, Jane came to me looking for help to position her for a sales role that would help her climb the career ladder. Since every position Jane had she was able to build a successful team and exceed sales quotas, I brought that up front and center as a personal brand statement at the top of her resume. Then she had some pretty powerful testimonials that supported that statement so hiring managers would know it wasn’t Jane just tooting her own horn. 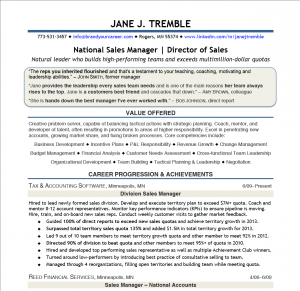 Within 5.5 months Jane landed a Director of Sales position at one of her target companies.